Today, Momma and I went to Miss Audrey and Caroline's house for a Christmas party. Miss Audrey made some yummy food (I really liked her corn casserole), we exchanged presents, and we took a group picture. And of course, we played a lot! Mary Catherine drew my name, and she gave me a play cell phone and a new book. She also gave me lots of tissue paper, too. Miss Audrey gave us party favors. Do you like my jingle-bell antlers? 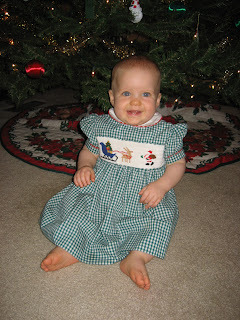 When we got home, Momma wanted to take a picture of me in my green gingham Christmas dress. 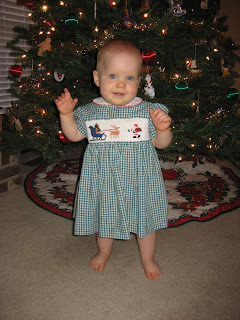 Who would even think it would be in the 70's two weeks before Christmas where a short-sleeved Christmas dress would even work?!? !